2003 Topps Opening Day stickers? Thread: 2003 Topps Opening Day stickers? Anyone got a scan. 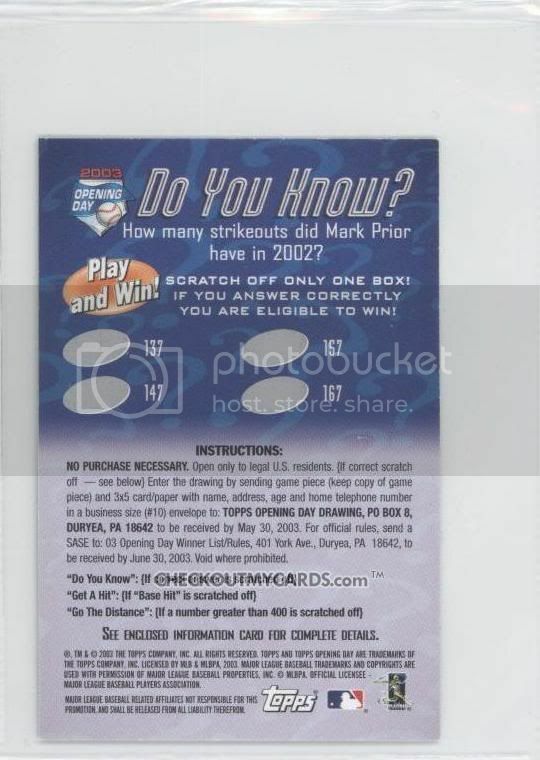 I have the regular version of the card but I also have a miniature version that has a scratch off game on the back asking how many strikeouts Mark Prior had in 2002. Is this the sticker version? I don't see a mini version on my checklist but the card I am looking at does not look like a sticker. Re: 2003 Topps Opening Day stickers? I have a couple of minis but I'm not sure if they are the sticker. I would say yes, the minis are the stickers. Looked on COMC and ebay and both show minis as the stickers. Here is a scan from COMC of your card, notice all of the space in the penny sleeve, indicating it is a mini size card. Yes they are stickers. I have a bunch of them but don't know where they are. Okay then. I just didn't think they were seeing as how the card is pretty dang rigid for being a sticker. Most sticker cards are pretty flexible. Well I'll mark it off then. Thanks guys.